The Norwegian Forest Cat is an ancient breed which originated in Norway more than 500 years ago. Some believe however that the breed could be up to 2000 years old. This gorgeous animal is also known as the Wegie, Norskogkatt, Skogkatt or Norskskaukatt. They are said, according to Norse Mythology, to be direct descendants of the fairy cats. It is also possible that the ancestors of the Skogkatt are Turkish longhairs, since several Byzantine emperors had Scandinavian guards in their employ. Since then these cats have been raised as farm animals often living outdoors and under shelter wherever they could find it. Possibly the Skogkatt evolved here since it is very well adapted to such a rigorous life. The Cat Fancy Association of Norway began in 1934 and it was not until 1938 that the Skogkatt was thought of as a special breed. Then, with the advent of World War II, all pedigree cat activities were halted. The Skogkatt was almost forgotten until the beginning of the '70s, when a group of fanciers began breeding programs again in earnest. In December 1975, Norwegian cat breeders started Norsk Skogkattring - The Norwegian Forest Cat Club - in a bid to preserve the breed and their efforts were rewarded because by 1976 the breed was officially recognised. The most common patterns in Skogkatts are tabby patterns. Although the semi-long fur sometimes needs brushing, this cat, for the most part, can maintain its own fur. It does however need help to remove twigs and any other clinging debris. Although this breed is considered 'tough' it does have a softer side and enjoys being playful, lively and affectionate. Because of its loving and gentle nature there is no reason it can't live inside the home - as long as toys, climbing objects and scratching facilities are provided. 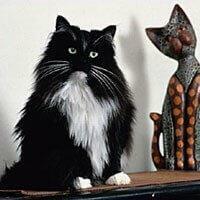 The Norwegian Forest Cat gets on well with other breeds of cat, dogs and is especially fond of children. The intelligence of this animal and its energetic and lively behaviour makes this a beautiful and interesting friend for everyone in the home.